Alfred Dunhill is a British design house specializing in men's clothing, luxury goods and accessories. The business began when Alfred Dunhill, just 21 years of age, took over his father's saddlery business, in 1893. The automobile was an exciting new piece of technology being developed at the time, and Dunhill transformed the saddlery into an automobile accessories store. Among the company's first offerings were such non-standard (at the time) accoutrements as horns, lamps and dashboard clocks. Dunhill also made leather overcoats, goggles and other accessories for drivers. The Dunhill shopping experience is designed to delight the male luxury goods consumer from start to finish. The retail stores are known as Homes, and allow the shopper to purchase clothing, luxury accessories and fine wines, followed by a haircut in the onsite barbershop, with a spa treatment to pass time while waiting for the next film to begin in the screening room. Dunhill revitalized its brand in 2005, introducing its luxury products to a new generation of customers and reaffirming the importance of menswear to the brand by the appointment of its first-ever Creative Director, Kim Jones. Dunhill fragrances, like the brand's other products, are designed for the male luxury consumer. The company has produced just one female fragrance to date 2001's Desire. The first men's fragrance under the brand was offered in 1934, the original Dunhill for Men. Alfred Dunhill is an old perfume house. The earliest edition was created in 1934 and the newest is from 2016. Alfred Dunhill fragrances were made in collaboration with perfumers Gerard Anthony, Philippe Romano, Michel Almairac, Maurice Roucel, Alain Astori, Michel Girard, Frank Voelkl and Carlos Benaim. 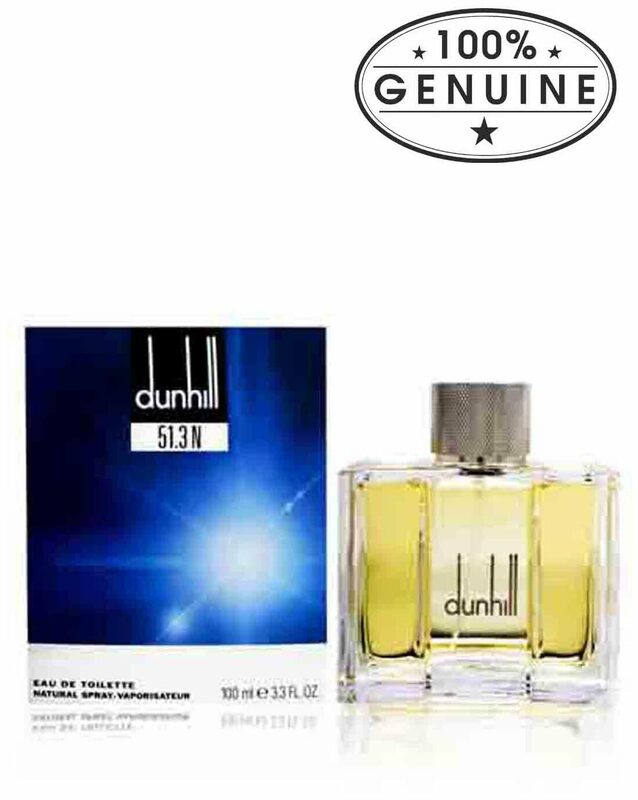 Vibrant and lively - the 51.3N luxury perfume from the acclaimed house of Dunhill, embodies the spirit of the confident and self-assured man. This scent is crafted for the determined go-getter, complementing his aggressive manner and relentless spirit. With a whiff of natural and woody accords that are blended into this perfume, you get the impression of exploring unchartered territory. The Eau de Toilette carries a subtle yet elegant scent that revitalises your senses with its aromatic compounds. The top note opens with a tart hint of rhubarb accompanied by a fruity scent of grapefruit. As you trail into the heart of the fragrance, you are treated to a mix of sweet and spicy hints of pink and black pepper along with fresh lavender and a strong scent of cedar. To cap it off, the base note harmoniously blends light vanilla with a distinct trace of sandalwood. With an array of fragrant elements this perfume befits any occasion you attend at any time of the day. Bottled in a glamorous square shaped vial it makes an impression as it sits smartly on your dresser. Dunhill 51.3N fuses together a variety of natural ingredients and brings forth a truly sublime scent that is a class apart. Heart Note: Pink Pepper, Black Pepper.